Once you have your final, master list of honors and awards to add to your LinkedIn profile, you want to do some research to create an optimized description that provides context around the award and showcases your contribution as award worthy. Start with a boilerplate explanation of the organization that presented the honor or award. Who are they and what do they do? Then describe the honor or award and what you did specifically to get the award. You want to aim for a couple of sentences, not a full-blown novel. The best way to get this information is to consult the Internet. 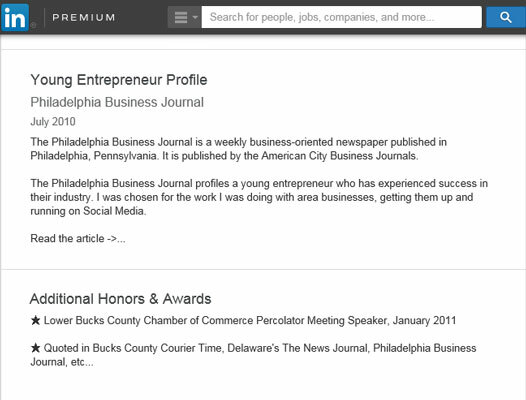 Run searches on the organization and check its website’s About Us page. Then search for the honor or award. Even if it’s not the exact award you received, you may find wording that is close to what you need. Rather than plagiarizing, use this content as a springboard and tweak it to make it work for you. If you have the Honors & Awards section already added to your profile, simply scroll to it and click the pencil (edit) icon to enter into edit mode, then go to Step 5. If you don’t have the Honors & Awards section added to your profile yet, scroll below the Contact Information section at the top part of your profile. Two sections appear that you can add. If Honors & Awards isn’t one of the options listed, click the View More link to expand the area and see a full list of sections to add. In the Honors & Awards section, click Add Honors & Awards. When clicked, the Honors & Awards section appears on your profile. In the Title field, enter the name of your honor or award. In the Occupation field, select the current or prior experience to connect the honor or award to a particular role. The drop-down list is populated by your current and previous experiences. By linking the honor and award to a position, the honor and award shows up in the Honor & Awards section and directly under the position it is paired with. In the Date field, choose the month and year you received the honor or award from the drop-down lists. If this is an honor and award that spans multiple years, or a date simply doesn’t pertain, feel free to leave the date field blank. In the Description field, enter information about the honor or award. Remember, it’s better to add context around your honors and awards, and the easiest way to do that is to search the web for already created content that you can tweak. Honors listed in the Honors & Awards section.